For additional information on UV Solutions advertising rates, please contact Janet Dunnichay at 785-271-5801 or via email at janet@petersonpublications.com. 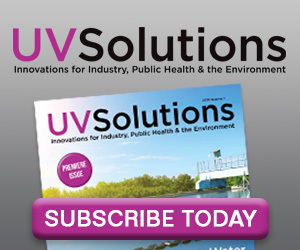 chemists, academics, government officials and policymakers who are interested in the use of ultraviolet technology for industry, public health and the environment. 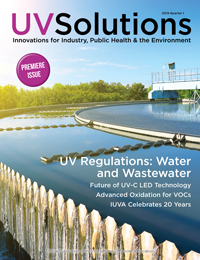 Each magazine is packed with information on wastewater treatment, food and beverage, pharmaceutical, health care and air treatment topics. The goal of each issue is to provide actionable articles that can impact operations now! Please send ad as a PDF file saved at a minimum of 300 dpi. (All fonts should be embedded.) TIF files also are acceptable. We will NOT accept application files (Quark, PageMaker, Publisher, etc.). Additional requirements can be found at www.petersonpublications.com. Advertisements can be sent to becky@petersonpublications.com. Our email system can accept large attachments, but sometimes large attachments can’t be sent due to limitations of certain ISPs. If an attachment cannot be emailed, one alternative is to upload the file to your company website or FTP system and send us a link to retrieve the file. We’ve prepared guidelines for preparing and sending electronic files. Please be aware that we do NOT accept QuarkXPress or Microsoft Publisher files. We accept .pdf and .tif files, prepared for high-end output. For more information, please review the guidelines. 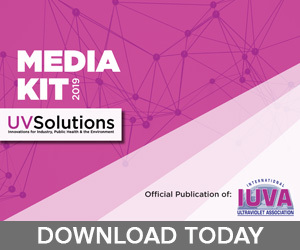 The UV Solutions website offers additional advertising opportunities to connect with customers and prospects through strategically placed web banners. The website contains expanded news stories, fresh content and live links to industry resources. • Leaderboard Banner – Located in the upper right of the website, this prime position advertising opportunity provides advertisers immediate, forefront exposure with direct links to their website. Three available placements with equal monthly impressions served. Ads are run-of-site, with visibility on all pages. • 1st Prime Column Banner – Located in the right column, this prime-positioned advertising opportunity provides advertisers with immediate, forefront exposure with direct links to their websites. One spot available. Ad is run-of-site, with visibility on all pages. • 2nd Prime Column Banner – Located in the right column right below the 1st Prime Column Banner, this advertising opportunity provides advertisers with immediate, forefront exposure with direct links to their websites. One spot available. Ad is run-of-site, with visibility on all pages. • Lower Column Banner – Located in the right column below the fold, this banner provides an additional opportunity for advertising. Ad is visible on homepage only. • Supplier Index – Advertisers are listed at no additional charge in a supplier index on the UV Solutions website and are categorized by product or service offered, including company name, contact information and web address with a direct link to the advertiser’s website. Send all banners as .jpg files only. Animated files will not be accepted.